As the atom is the smallest discrete unit of matter, so the scene is the smallest discrete unit in fiction; it is the smallest bit of fiction that contains the essential elements of story. You don’t build a story or a book of words and sentences and paragraphs — you build it of scenes, one piled on top of the next, each changing something that came before, all of them moving the story inexorably and relentlessly forward. You can, of course, break the scene up into its component pieces — words, sentences, and paragraphs — but only the scene contains the vital wholeness that makes it, like an atom of gold, a building block of your fiction. It contains the single element that gives your story life, movement, and excitement. Without this one element, you don’t have a scene, you merely have a vignette. So what is this magical element that gives your scene its life and makes it the brick with which you build your fiction? When is a scene a scene? When something changes. What defines the completion of a scene? The moment of change. We’re going to create some very short scenes here — I’ll do some demos, and then you’ll do some practice scenes. We’ll start with the simplest of all possible scenes and work our way to scenes of greater complexity. But you’ll find out that even the most complex of scenes become rather simple when taken down to its component parts. In the heart of the command center, a single wire, stiff and brittle from ten-thousand cycles of heating and cooling, snapped away from its circuit board. The break set off an alarm — a tiny pulse of electricity that raced through the wires to a monitored board at a control panel half a mile away. The pulse reached its destination, a tiny light that should have come to brilliant red life. But the light — never used, infrequently tested — failed to switch on. Those two tiny failures — broken circuit; burned-out bulb — would have unimaginable consequences. Okay. That’s a whole scene, though there isn’t much to it. It comprises the essential elements of scene — a place, a time frame, and a change that moves the story forward. We know that something vitally important has happened, because we’re reading about it. (If it weren’t important, why write it?) We have some feel for the story — lives no doubt will depend upon the smooth functioning of the control panel and the command center, and we already know that there’s a glitch that no one else knows about. When we started into the scene, the command center was working smoothly. When we left it, there was a problem, and a problem heightened by the fact that the people who needed to know about it didn’t. Now it’s your turn. Write a brief scene with no characters, a clear location, a limited period of time, and a single event that changes and moves the story forward. (You don’t actually have to have a story in mind. Just pretend you do.) When you’ve finished it, come back and we’ll move on. Okay. Next, we’ll do something a bit fancier. This time, we’ll do a scene that has one character in it. No dialogue yet. No interaction. Just one person making one change. Here’s mine. He danced into the kitchen through the green double doors. He swirled. He pirouetted. He wore her blue dress, her blonde wig — the Dolly Parton one — her bra (and stuffed into her bra several pairs of his own dark blue lightweight wool dress socks), and her Elizabeth Arden makeup, which he had applied with a skill that would have astonished her. He tangoed past the refrigerator, humming something dramatic from the opera they’d attended the night before — he didn’t know the name of the piece, but had not been able to get it out of his head since he’d heard it. He slid between the blue-tiled counter and the butcher block island on which sat bright red bowls full of peaches and lemons and oranges. He gave his hips an electric shimmy, admired his reflection in the floor-to-ceiling mirrors that covered the kitchen’s far wall, and reached his arms left — right — left. On the second left, something flashed in the morning sunlight, then disappeared into the blue dress’s deep pocket. He spun, kicking up a leg with a grace that would have shamed many a chorus girl, and tangoed back out the way he had come, still humming. On the kitchen counter, a single empty slot in the knife block marked his passage. Top right slot — one of the big ones. Instead of fourteen knives, there were now unlucky thirteen. The heels of his dancing shoes clattered up the elegant oak staircase — size thirteen shoes, black patent, with three-inch heels suitable for dancing. He’d looked a long time before he found those shoes. What changes occur here? Our expectations of the character are the primary change. We find out at the beginning that he’s at least a cross-dresser, and (as suggested by his skill with makeup) one who’s been hiding his secret for a while. We discover that he’s either married or living with a woman; we know that she has expensive taste in makeup and questionable taste in wigs; we know that she doesn’t know about his hobby. Initially he seems harmless and happy, if a bit weird — but as the scene goes on, we get a tiny surge of foreboding (lightly foreshadowed by the butcher block, the red of the bowls) with the mysterious something that flashes in the morning light before disappearing into the pocket of the dress. With the revelation that the knife block is suddenly one knife short (the slot in the top right is usually reserved for the butcher knife, incidentally), our friend’s antics no longer seem so harmlessly eccentric. And the revelation that he bought the shoes himself — that he spent a great deal of time finding just the right ones, suggests a change in his habits, an intensification or commitment to something going on inside of him that, tied in with the missing knife, bodes badly for the future. Now it’s your turn. Write a scene in which a single character moves through one location in a limited period of time, saying nothing, and makes a single change that moves the story forward. “And why is that?” I didn’t return his smile; I’d never much cared for him, and I liked him even less when he was sitting across the table from me in my little tavern, in my corner. He laughed, not put off by my manner. But he was that sort — the kind of man who refused to believe that a woman might not find him attractive, might not be flattered by his attentions; might, in fact, prefer her own company to his. Insults rolled off his oblivious shoulders because he simply refused to believe a woman might mean them. “I see,” I said, not seeing at all. The change here is gradual. We know the main character doesn’t like the man who wants to hire her, and we gradually get a feel for why — he seems slimy. We find out that he’s married, and this confirms to us that he’s definitely not the right man for our hero — her instincts are good. Then, however, we discover that he’s the sort of guy who would hire people to kill his wife, and we suddenly realize that our character shouldn’t even think about working for this scumball — except, if she doesn’t, who’s going to save his poor wife. We go from disliking this guy a little to disliking him a lot. As changes go, it’s fairly small, but enough to give us a complete scene and to move the story forward. There are a million more of these. You might want to make a list of them — it can come in useful when you’re stuck on a scene and you need a few prompts that can get you unstuck. The big thing to remember in writing a scene — any scene — is that it isn’t a scene until something changes; and once something changes, it’s time to move on. Need more help with scenes? 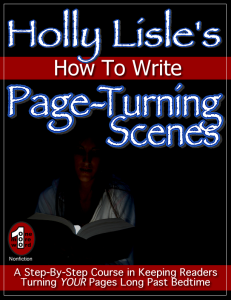 Get How to Write Page-Turning Scenes. Thank you for this valuable resource. I’m sure it will be invaluable over time.